International team consisting of specialists from KERI Nanocenter (Miryang, Rep. of Korea), from 3SMK (Seoul, Rep. of Korea), from Interface (Moscow, Russia) and from IMT RAS (Chernogolovka, Russia) were successful in design, optimization and fabrication of high quality rainbow holograms. The rainbow holograms consist of diffraction gratings of variable duty cycle with a minimum stroke size of 50 nm. These gratings cover the whole area of the cylindrical stamp. to usage of industrial e-beam lithography systems as much more cost effective tool. 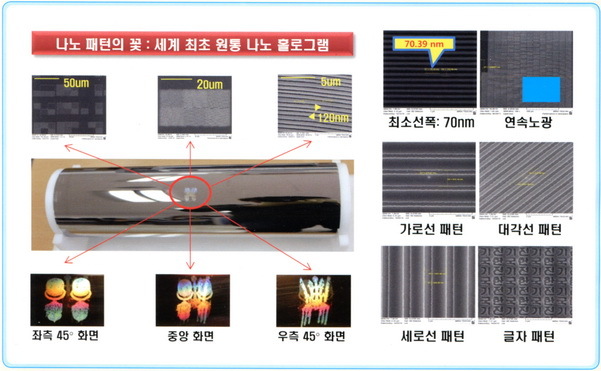 As result Korean parties (KERI NanoCenter and 3SMK) have leased out "RainBow" software and in their part Russian partners performed training to hologram design/optimization and provided support for e-beam lithography. Fig.1 SEM based electron lithography provides fabrication of hologram of highest quality (with stroke width from 50nm) on a cylindrical mold (with area about 30 cm by 30 cm). Nano Process Research Center is a division of the Korea Electrotechnology Research Institute (KERI) in Miryang (Rep. of Korea). Center researches in the field of fabrication and the associated process system of a large area nano cylindrical mold which is the core technology for nano printing technology. The main research topics are cylindrical nano lithography utilizing magnetic levitation, cylindrical plasma nano-etching, and the application technologies utilizing nano cylinder mold. 3SMK (Seoul, Rep of Korea) - small private company established for promoting scientific developments to industrial production. Interface, Moscow is the Russian leading supplier of tools and solutions for ERP systems and Hi-Tech solutions for nanotechnology. Company provides a full range of services aimed at improving the efficiency and sustainability of the business, helping to implement progressive changes in the organizations. the physical principles of the elemental base of the nanoelectronics and quantum computers.